Sumptuous red-wine-colored velvet, a gorgeous floral gown and a giant orange sash popped at Sunday's ceremony. The Critics’ Choice Awards, held last weekend in Santa Monica, California, showcased a fairly low-key red carpet, but some colorful looks were a welcome sight in a sea of white and black. I loved the rich velvet Ralph Lauren gown worn by Emmy Rossum (“Shameless”) — it looked like a perfect red wine on a winter night, in dress form — and the springlike burst of florals on “Crazy Rich Asians” star Gemma Chan’s exuberantly pretty Jason Wu dress. 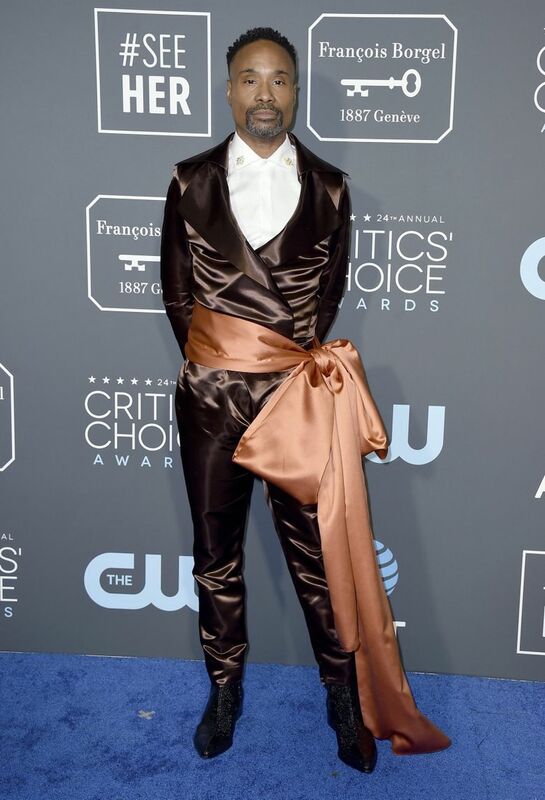 And yes, that enormous orange sash worn (over a brown satin jumpsuit, no less) by Billy Porter, of “Pose,” was unexpected, but it was also kind of insanely gorgeous; like the sort of thing worn by a nobleman in a centuries-old painting. You wonder, though, how it stayed on. Velcro?